Helena is a North Londoner living in the hills of West Wales. Her first collection of Flash Fiction 75 x 75 = Flash Fraction tells 75 stories each captured in exactly 75 words. She has a 100 word story ‘Death and Life’ included in the anthology of Micro-Fiction ‘Pod’ published by Leaf Books in 2011. Online publications include Paragraph Planet and National Flash Fiction Day. 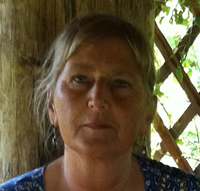 Helena is currently working on a book of short stories due for publication at the end of 2013.